Pleasure driving horse in a show harness with overcheck. The type of equipment you will need will vary depending on what type of horse you have and what type of driving you intend to do. 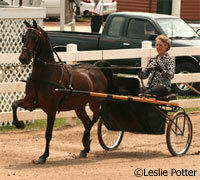 Pleasure driving classes are popular at breed shows. In these classes, the driver sits in a two-wheeled cart and the horse wears a show harness that does not have breeching. Breeching is used by carriage drivers to prevent the cart from running into the horse’s hind legs when going downhill, so only use a show-type harness if your driving will be restricted to level ground. 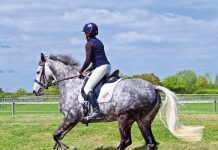 The rules for some saddle-type horses and ponies, such as Hackney Ponies, Saddlebreds and Morgans may specify that an overcheck or sidecheck should be used for pleasure driving classes. However, these devices are generally not recommended for working at home as they can restrict your horse’s ability to bend properly. If you must use a check, make sure it is adjusted loosely. 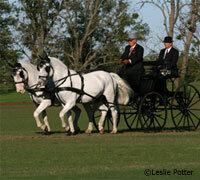 If your plan is to drive your horse in a carriage, you have several options for vehicles and harnesses. Besides the addition of breeching, carriage driving harnesses may also have a full collar instead of a breast collar. The full collar is considered appropriate for heavy carriages and is not necessary for lightweight vehicles. 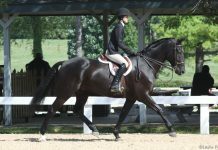 While show harnesses typically include a running martingale, carriage harnesses may not, or they may include a standing martingale. Overchecks are generally disfavored for carriage driving and are prohibited in competition, but sidechecks are optional. A sidecheck may be a good option if your horse or pony has a tendency to try to graze while hitched as it will prevent him from putting his head all the way down without excessively restricting his ability to bend and flex. Your selection of an appropriate vehicle will depend upon your goals. If you hope to compete in carriage pleasure driving classes, it is essential to select a carriage and harness that match each other and complement your horse. The nuances of selecting appropriate equipment and appointments are far too extensive to address in this article. Consult the USEF or American Driving Society rules for more information. If you intend to drive only for pleasure and exercise for your horse, the style of your cart becomes less important. However, fit is of utmost importance for the safety of you and your horse. The American Driving Society has a sizing chart to help determine what size vehicle is appropriate for your horse. Click here to view the chart. Wonderful article with very sound advice,especially pertaining to safety. One other piece of equipment that is good insurance for a green driving horse would be a kick strap. It is run through the backstrap,over the hindquarters from one shaft to the other. It prevents the horse,should he decide to kick or buck,from being able to get enough leverage to do any real damage. I love driving! I don’t use an overcheck but they sure do come in handy once in awhile when you have lots of tempting grass.